Have been listening to a lot of comments and saw a lot of photos about this place. 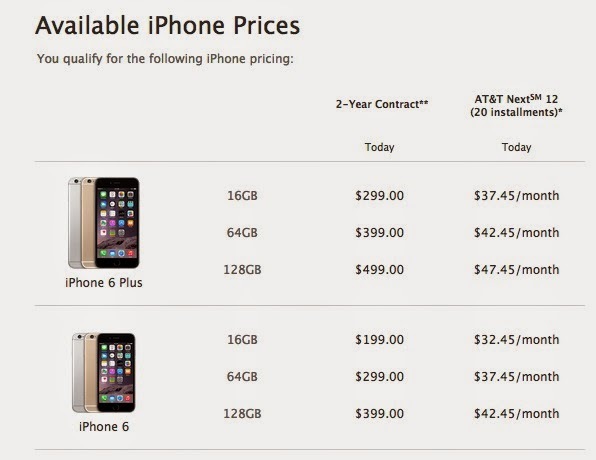 I've came across the affordable price with the worth-the-price portion! All the flavours are well-blended by Two Pesos. Sorry, there is no English version. FYI, I can read Chinese and speak fluent Mandarin. Back to the topic, I will roughly list out some of the special flavours they have. 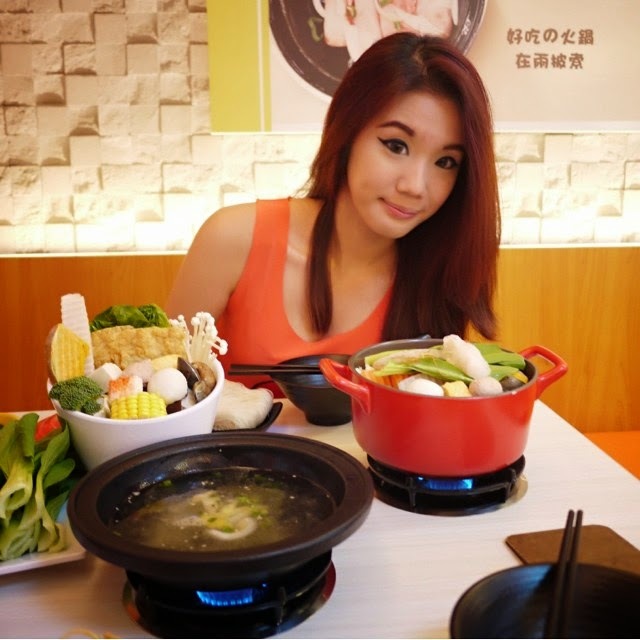 For example, Milky Steamboat with Seafood, Sukiyaki, Mongolian Herbal, Taiwanese Satay and more! My friend ordered the Two Pesos Stone Pot which is the clear soup. This is not the only ingredients, of course. Oh yes, this belongs to my friend. Seafood, Corn, Vegetables and etc. I ordered the Milky Steamboat with Seafood. This is how it was when the waiter served me this pot. Turn up the flame and boil the soup. The ingredients will slowly immerse into the MILKy broth. 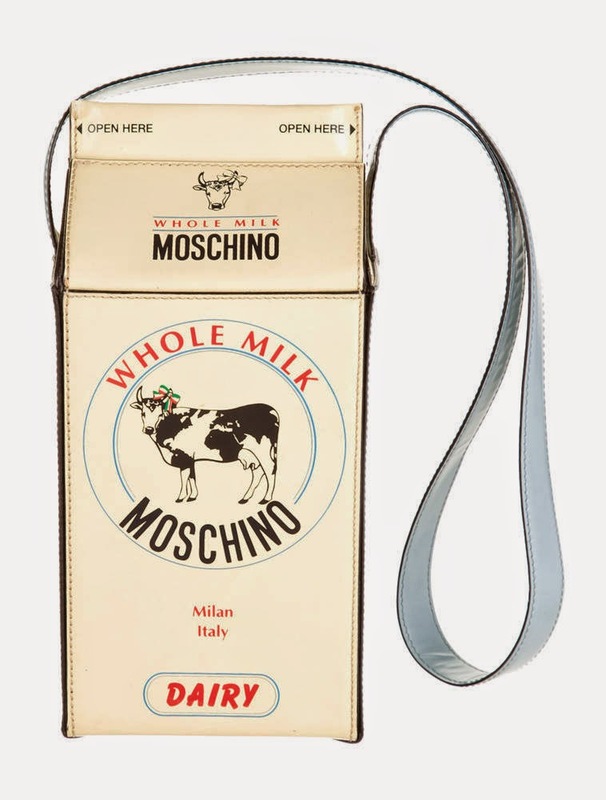 I love milk and of course, milky products. Concentrated(Don't imagine it as Condensed Milk), creamy and the taste is just nice. If you don't fancy milk that much, don't try this. How can I not take a picture with my first Milky Steamboat? 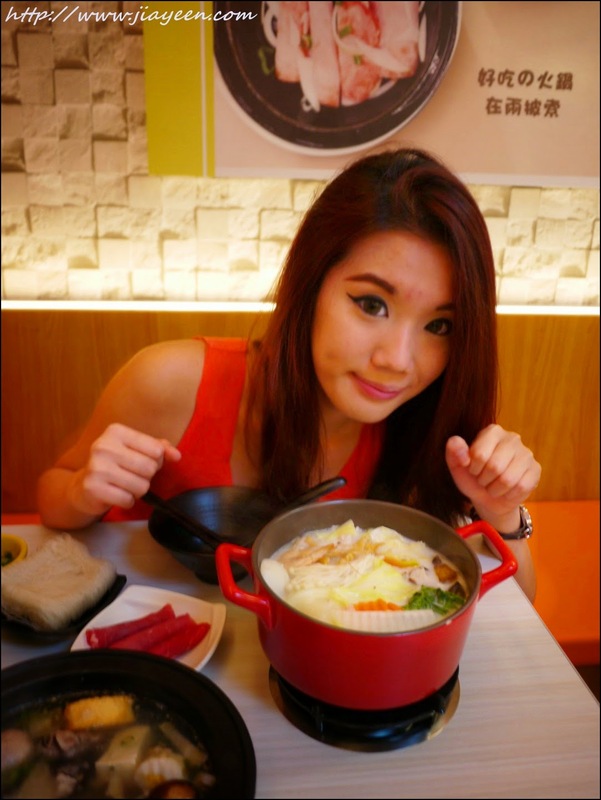 A closer look of me with my Milky steamboat! Due to the affordable price, you have to do some of the things by yourself. Top up your own broth. Get your own utensils and sauces. Another thing is......if you are going in a group of more than 4, you all might have to sit separately because they do not have long table to cater for a big group of more than 4. Operating hours: Daily 12pm till 3pm, 6pm till 11pm. Belgium Dark Chocolate and crunchy hazelnut cake topped with Salted Caramel Popcorn. It is super rich in Chocolate. I don't usually fancy Chocolate. When I do, it must be good chocolate, especially Dark Chocolate! A cupful of Sunshine RM10.90. The name is a bit deceived. It is surprisingly refreshing with passion fruit puree and crumbles. I went to this place on a Public Holiday. Therefore, not many choices left for me to choose from. 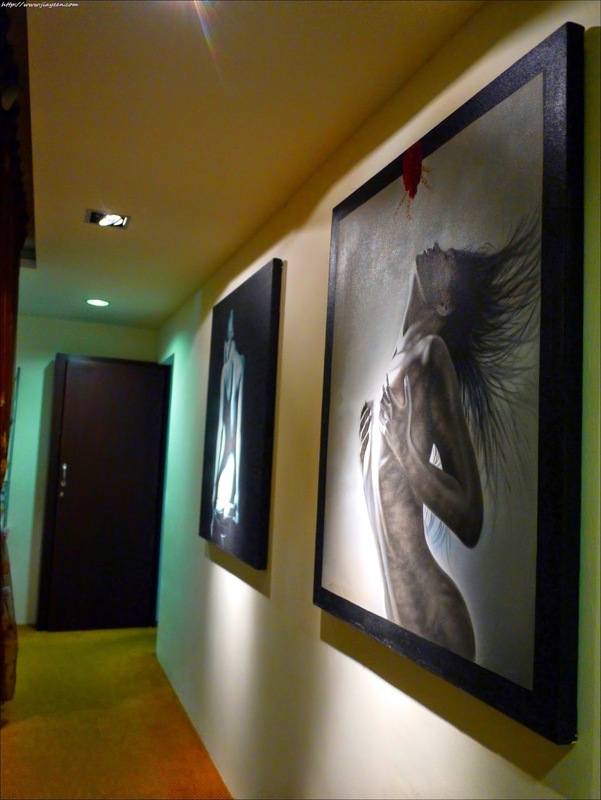 B-G-3A, Block B, Oasis Ara Damansara, Petaling Jaya. Open 10am-5pm, except Mondays. Dinner service commences July. One day, I was curious enough......to get this from iMart! 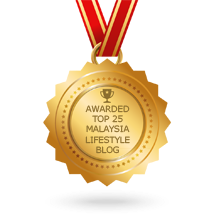 Today, I am going to share something new with you all, my dear readers! It is the....CATHY DOLL DOOM DOOM BREAST CREAM! Ingredients: Albumen, Almond oil PEG-8 esters, Aloe Barbadensis extract, Aqua, Ascarbic Acid, Carbomer, Hyaluranic Acid, Vitamin E, Titanium Acid. Formulated in Korea but made in Thailand. 2) Apply all over your breast. 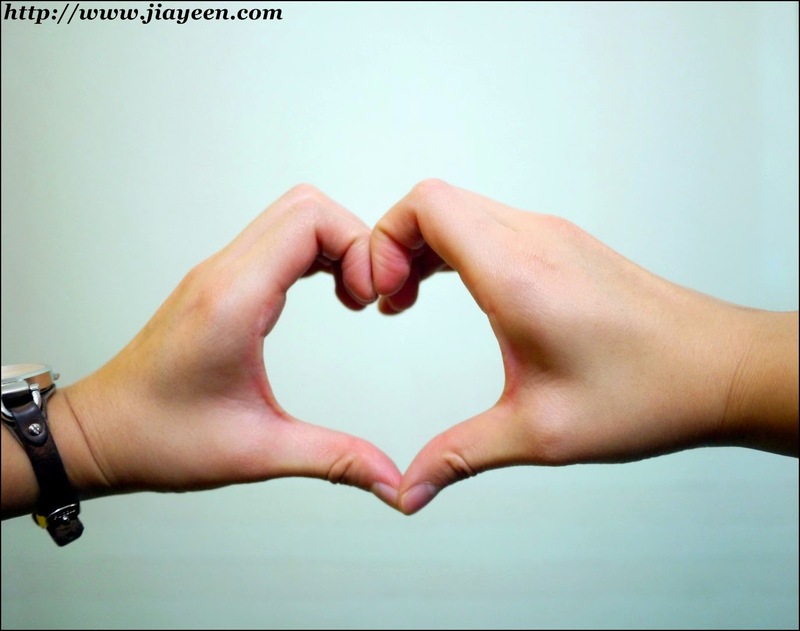 3) Massage it for 5-10 minutes as illustrated in the video above and picture below. 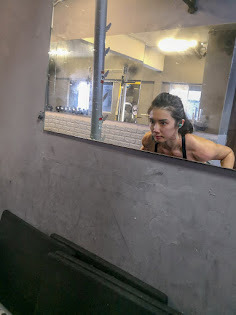 5th Week: Enlarge by 1 cup size! 21st Week: Enlarge up to 3 CUP SIZES!!! One pack of 70g can lasts for one to two weeks if it is in good use and with appropriate amount. A nice body shape will boosts up a lady's confidence. 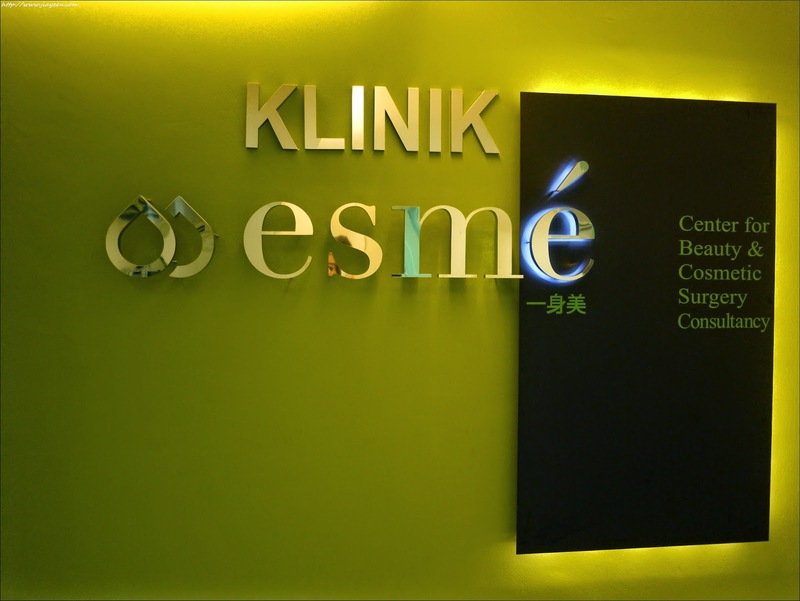 Esme is a center for beauty and cosmetic surgery from head to toe. It strives to achieve the best quality of services to their customers in the best environment under the best care from the consultants and doctors. 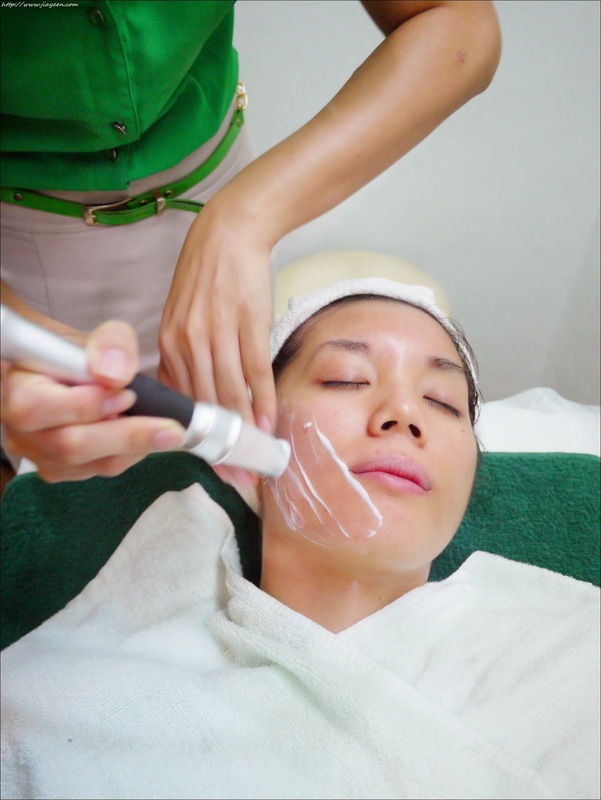 It covers from Facial procedures, Breast procedures, Body procedures, Skin treatment to Anti-Aging & Wellness. Esme believes in a simple change on us can change our entire lives. By achieving so, all you need to do is setting up a simple appointment with their friendly consultants as they will try to figure out the most suitable treatment for you, either surgical or non-surgical. Eating correctly, exercise regularly and avoiding unnecessary pressure are no longer efficient enough to keep up with the pace of our current lifestyle. 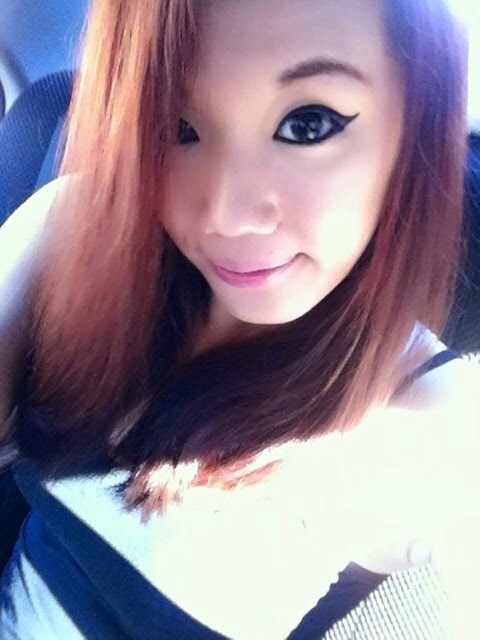 If we can be more beautiful and more confident? Do you want to be naturally more beautiful? I went for a private consultation at Esme on the other day. "You are slim enough", "You don't need all these", bla bla bla. As I said, WHO doesn't want to be more beautiful? If I have the opportunity, WHY not? 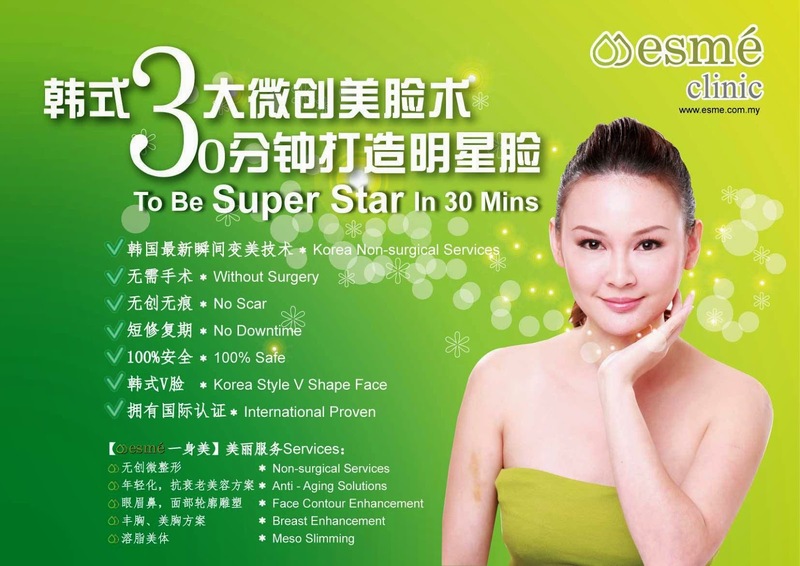 My pretty consultant, Carlyn told me that "Esme V Line Facial Treatment" is suitable for me at that moment. 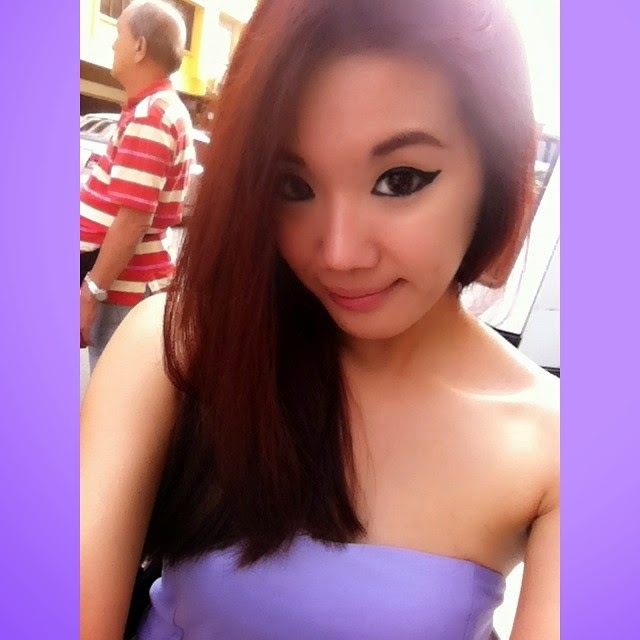 Oh yes, I already have V-shaped face but I don't mind having a more "V" Face! 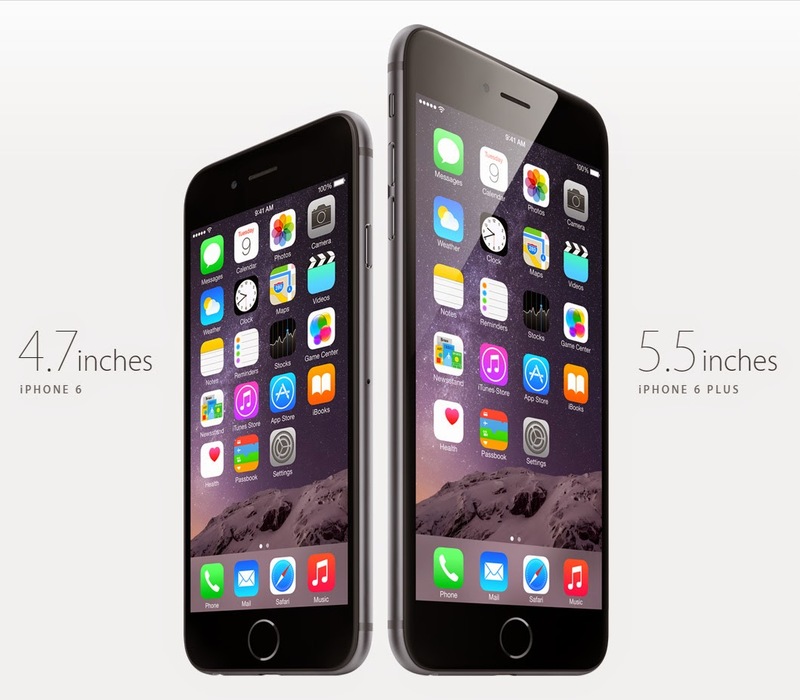 It will makes me look thinner and have sharper facial features in sight. The waiting area is rather relaxing and soothing as compared to other center I have been to. 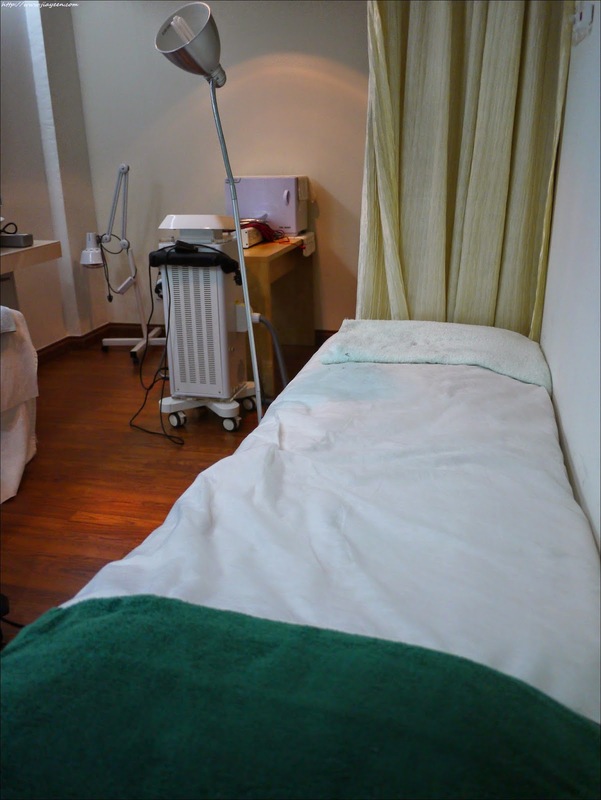 So here is the Treatment Room that I am going to have my treatment in. This machine is also the machine I am going to use. The whole concept of this center is comfy, Comfy & COMFY! 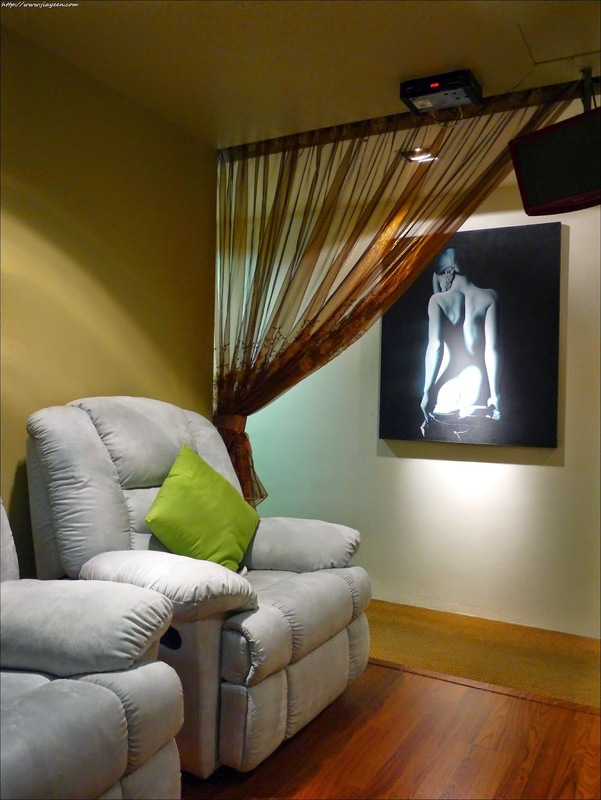 As above, even the waiting room gives people the feelings of relaxing and soothing. Back to the main topic here, AHERM PEOPLE! 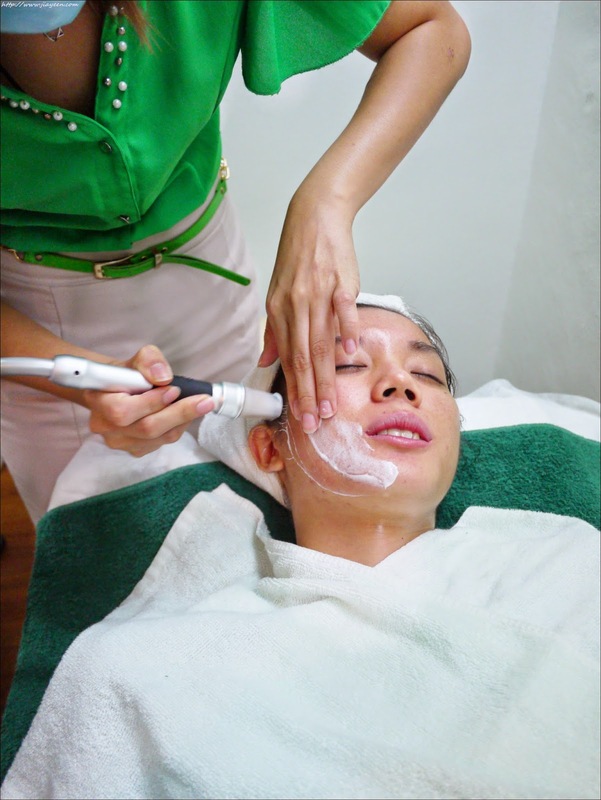 This treatment is not a very complicated treatment as it only involves the movements of the machine and their special facial cream which reduces the friction of the movements. This is what I meant "without surgery". This is not the usual philosophy as we always said "No Pain, No Gain". It is all started off with cleansing a.k.a. removing my makeup and dirts. The friendly consultant removed it patiently and gently for me with their makeup remover as she wants me to lay back and enjoy the whole process. Their makeup remover is so nice to use as it removes makeup easily, even the waterproof makeup! Can't you see how relaxing I was during the process? 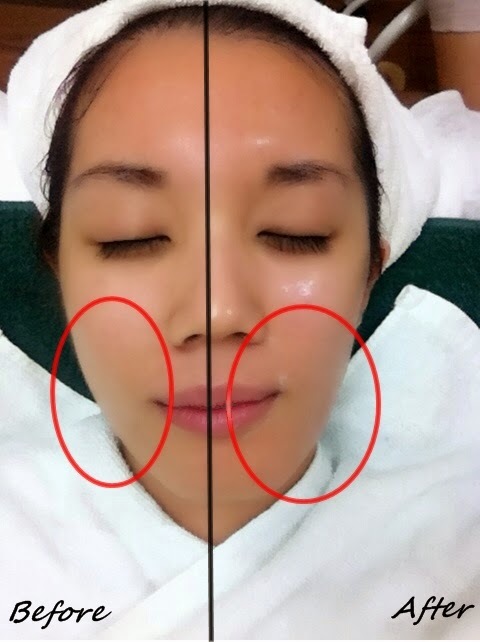 Yes, The next process are applying cream and kick off the V-LINE SHAPING TREATMENT! 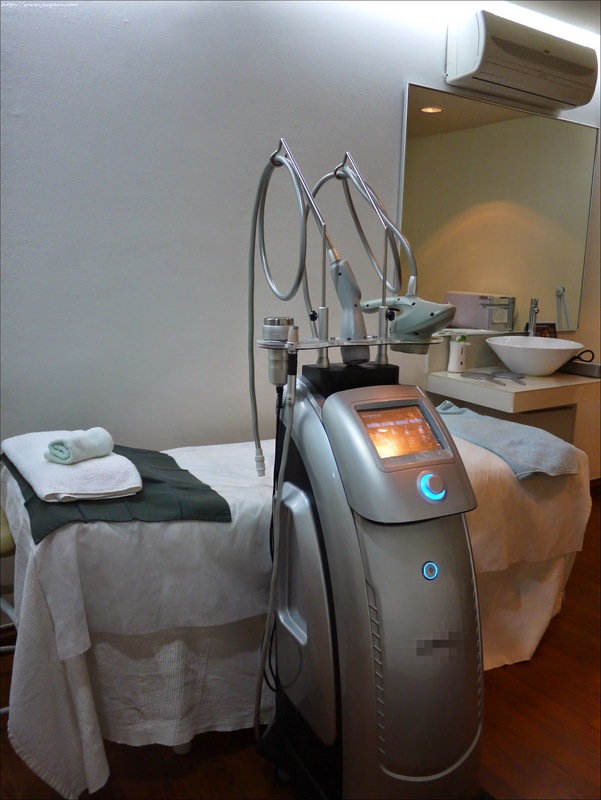 It is the slow-pace suctions of of the machine which allow the facial shaping treatment to happen! It awakens my face and allows it to stay in the V Shape for one week, it varies across individuals actually. The difference between Before and After. Only ONE treatment and the effect is so obvious! 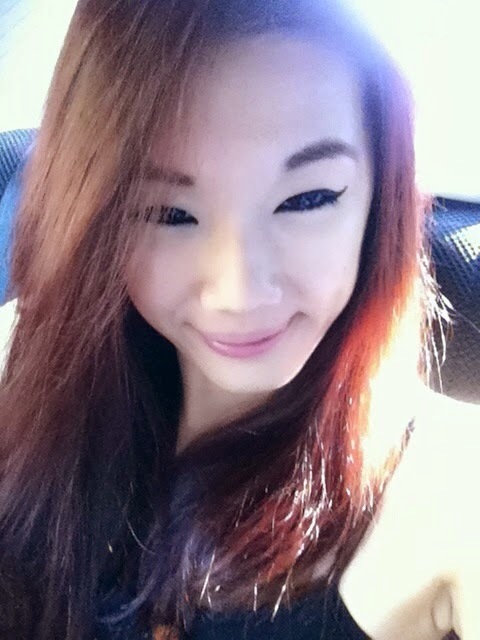 My chubby cheek is gone on the "After" side! WAIT! I AM NOT DONE YET! continue READING IF YOU WANT SOME GOODIES! 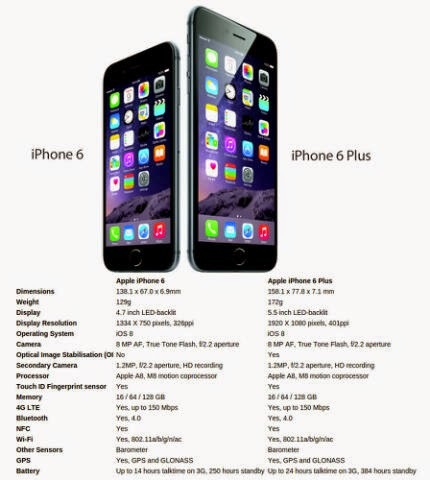 If you have not seen. Oh yes, V V V V! I can't stop showing off my V-shaped face! It was so obvious! Even my cheeks look more 3D and obvious! Their latest treatment - Carbon Blast Treatment! 光疗嫩肤! Call them now or visit their Facebook Page now to book a private consultation appointment with their consultants! Just 30 minutes and you will be naturally more beautiful! 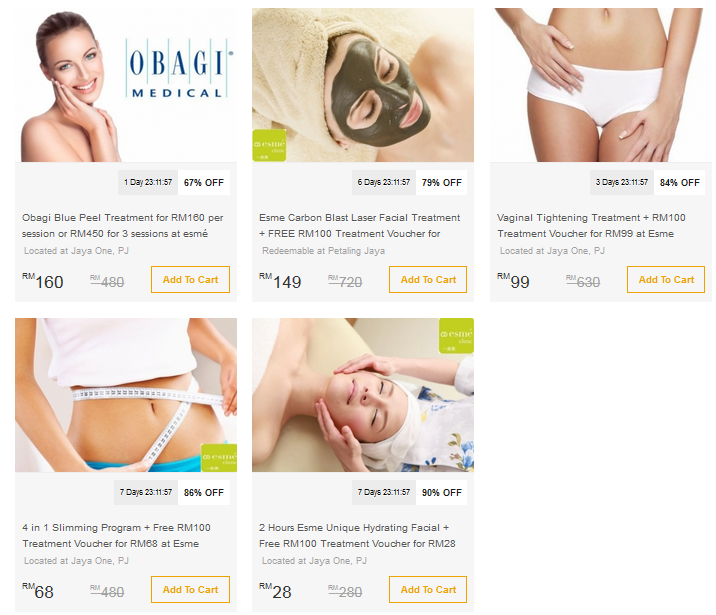 Visit MilkADeal now if you want to try their other treatments. It is quite amazing that the fashion trend is getting more and more unique. For example, Vintage. 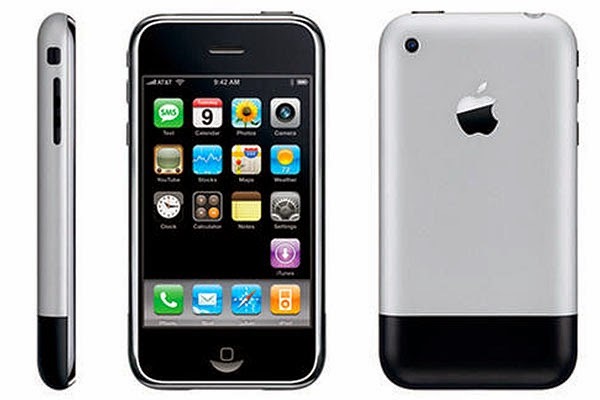 It used to be called as "OLD", "OUTDATED", "NOT FASHIONABLE". But hey, it's back now, especially the Korean Fashion trend. 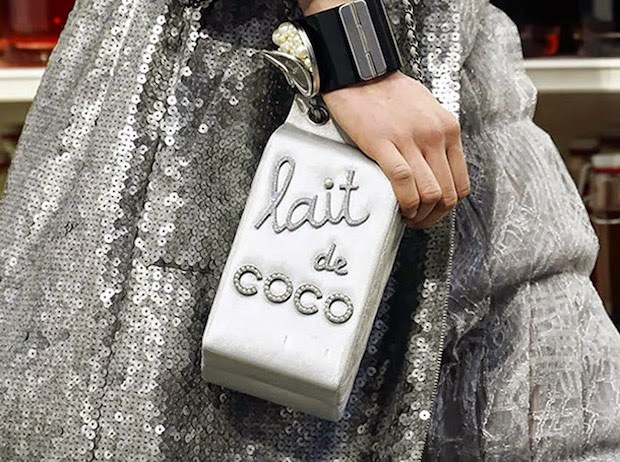 I was quite amazed with the latest fashion handbags trend. Yes, you never got it wrongly. I am talking about FOOOOOOOOOODD! Of course, they look REAL and YUMMY at the same time! I wish I could eat them but....they are more exclusive than the real food! The sequence is not in order. 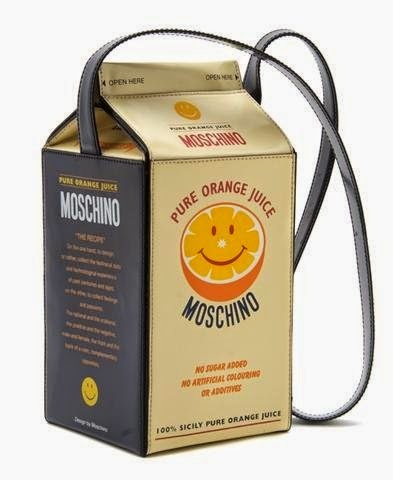 Oh yes, A design of Orange packet drinks. 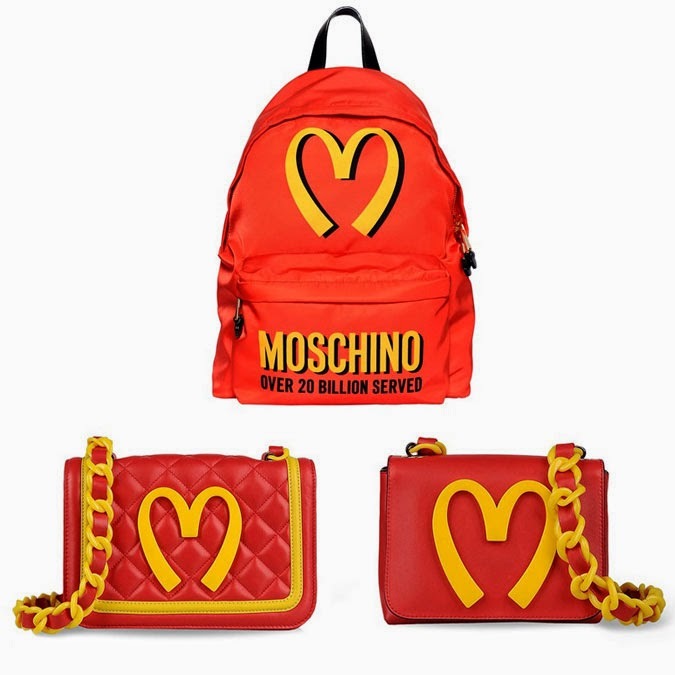 They are very famous of their McDonald's inspired design. They have cleverly infused the Golden Arches logo of McDonald's with their iconic heart-shaped "M". 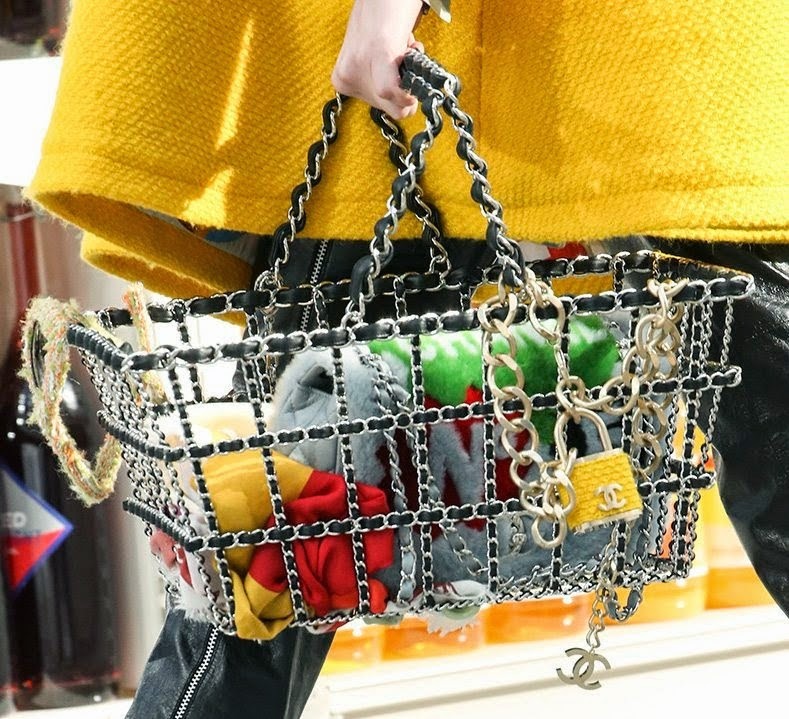 This is just a sample of model walking through the grocery store with Chanel's handbag and shopping basket! 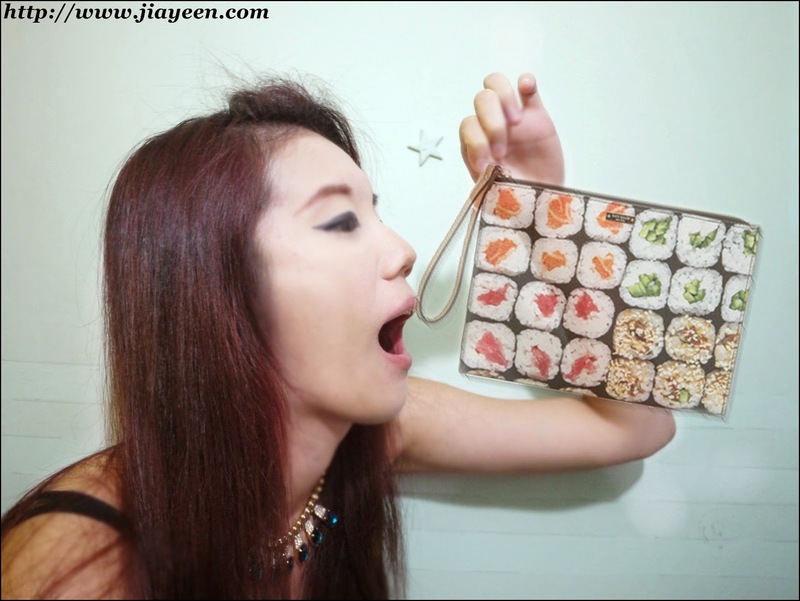 This handbag definitely looks yummy to me! 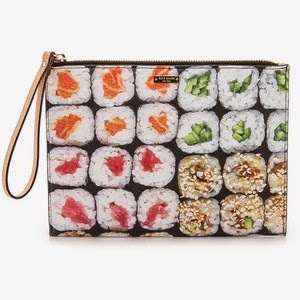 How can you resist SUSHI? This handbag belongs to HELLO SHANGHAI series. As it is a Chinese take-away boxes inspired handbag, Kate Spade has succeeded in making it looks unique and fashionable at the same time! 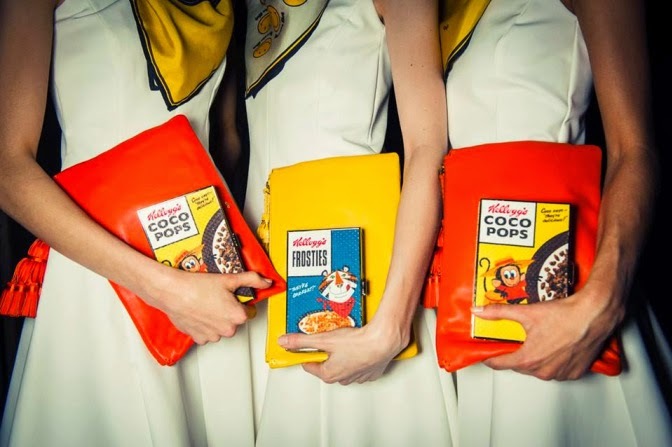 Anya Hindmarch came out with our childhood snacks, Kellogg's inspired handbags/clutches! 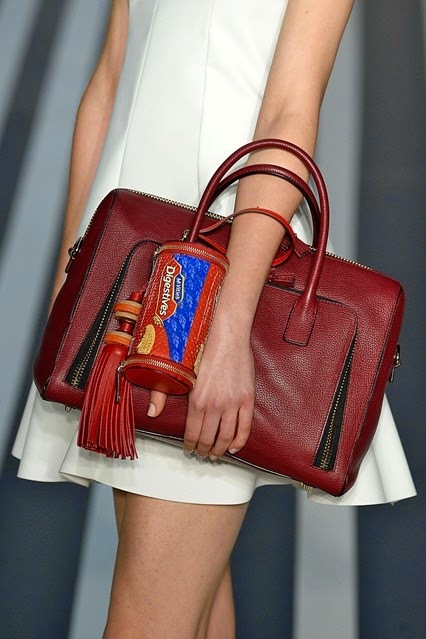 Of course, the Digestive Biscuits as well! 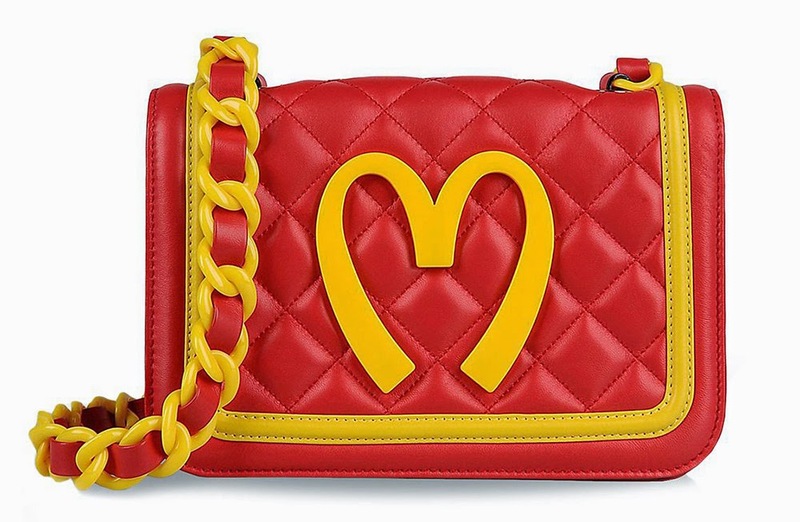 What is your favourite Food-inspired handbag?